Over 600 secular vocal works (mainly Lieder). Seven complete symphonies, plus sacred music, operas, incidental music. A large body of chamber and piano music. Beethoven lit the torch of Romanticism. Schubert ran with it. To read more about my thoughts on Beethoven, click on this internal link above. With Beethoven, any “side-stepping” keeps the theme in mind. His “digressions” are parallel paths to the theme. 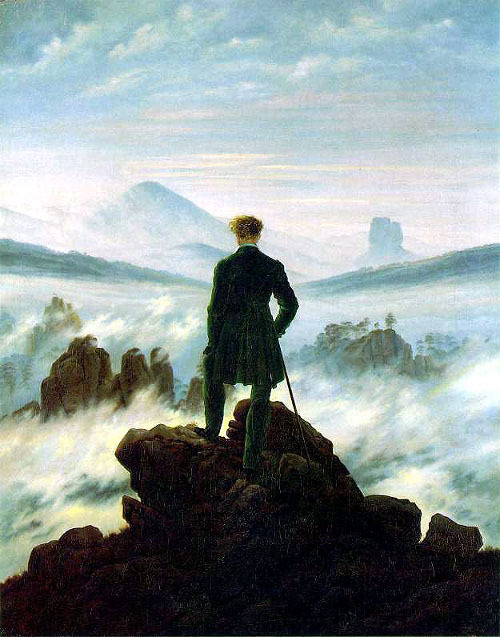 Schubert, in contrast, becomes involved in the mist of a beautiful melodic journey. Development is often not called for. To him it seems too intellectual. Romanticism’s span was approximately from 1800 – 1850. It elevated folk art and ancient custom to something noble. Spontaneity became a desirable characteristic (as in the musical impromptu). Some of Schubert’s great creativity is to be found in with his Impromptus. In contrast to the Rationalism and Classicism of the Enlightenment, Romanticism revived medievalism . Elements of art and narrative perceived as authentically medieval. This was an attempt to escape population growth, early urban sprawl, and industrialism. A romantic painting of someone cutting loose. We need the return of beautiful song once more. “Composing” today is created by formula. Many songs of today use only three harmonies. The three harmonies always appear in the same order. Their melody is about as limited as their harmony to three tones. Here is the point: When you feel constricted by difficult times, you need to “cut loose.” Singing or performing constricted music can make you feel even more hemmed-in. Our current composers need the style of the “beautiful melodic journey” of Schubert.